This project is concerned with social attention, that is, the special ways that we attend to other people in the course of interaction, and how technology affects this. Our larger goal is to pursue the reflective opportunity design space, both through examining important, overlooked socio-technical phenomena and through essaying novel designs. Such designs may influence (1) specific elements of the user experience (such as learning, inclination to partici-pate) and (2) more general, diverse outcomes (such as mood, attention, interactional synchrony, feelings of satisfaction, loneliness, and anxiety). In a short period of time, computerization has moved from providing a counterpoint to life, with the potential to highlight and shade experience, to constituting a constant force, almost defining our experience of life. This makes computerization like government: we mostly all agree that government is a good thing, but we may not agree about exactly how, when, where and why it should operate. This work is both high reward and high risk; it is high reward because of the enormous role that computer systems play in the interstices of every-day existence and the fact that the influences that computer systems have are not necessarily well-understood by user, creators or analysts and the potential for novel and more beneficial approaches to design. It is high risk because both expert and popular imagination are so oriented towards the creation of smooth, unnoticeable user experiences, that it is difficult to im-agine a think-tank or process that creates alternatives. What gives these designs importance are the ways they either prioritize seams in interaction, making the balance between the machine’s influence and the human push-back more obvious, or they allow people to nudge one another and themselves in particular directions, or both. These differ from persuasive technologies, because the agenda is not content-based. Instead, this work brings the moral authority of the computer and our interactions through it under implicit and explicit scrutiny. In this study, we ask participants to play a collaborative Sudoku game while in the same physical location. 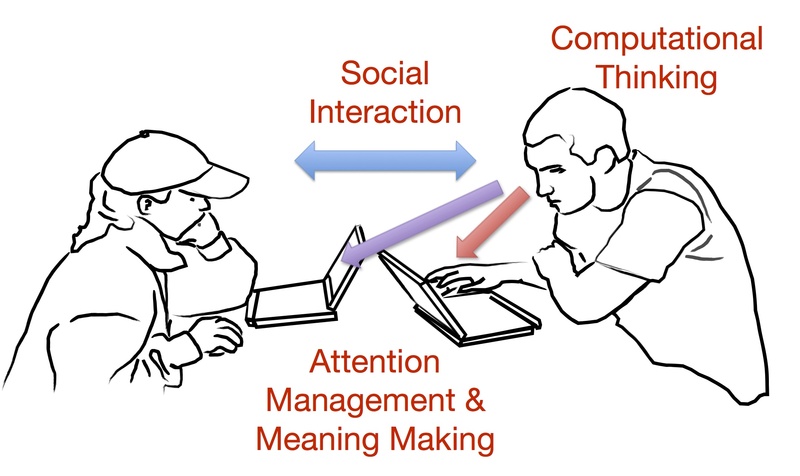 Baron (Barron 2003) describes students solving a problem together as jointly inhabiting a “dual space” involving the management of both cognitive and social functions. We (Lee et al. 2012) have previously described the increasingly common situation as representing a “triple space,” in which participants are managing not only the cognitive and social functions described by Barron, but also the challenge of making sense of the changes to the shared medium caused by the other players. How is it that groups of people can complete joint tasks without the expected observable markers of “successful” coordination? The relationship between micro-level, situated actions and broader outcomes such as opportunities for learning is under-explored. We investigated co-located groups as they played a collaborative, problem-solving game using distributed technology on laptops. Our investigation (Lee et al. 2012; Lee & Tatar 2012) suggested a more complex interaction between technology design and user experience than had emerged clearly in prior work. In particular, they found that proxies such as “amount of talk” or even “kinds of talk” proved poor indicators of the satisfactory nature of the system. There was considerable variety in how groups accomplished the work. Some satisfied groups talked a lot but other satisfied groups did not. Talk was diagnostic of satisfaction but lack of talk was not diagnostic of dissatisfaction. In fact, groups that had little or no discourse differed considerably from one another. One kind of group completed the joint tasks very well without observable markers frequently associated with success. Others were less successful in the task goal but manage difficult interpersonal situations. Building upon upon Deborah Tatar’s doctoral work on Social and Personal Effects of Preoccupied Listeners (Department of Psychology, Stanford University, 1998), we investigate the effect on the perception of all parties to conversations that have ICT-caused distractions. Such distractions include checking cell phones for text messages and having televisions playing the background of conversations. Barron, B., (2003) When smart groups fail. The Journal of the Learning Sciences. Clark, H., (1996) Using Language, Cambridge University Press. Lee, J.S. & Tatar, D., (2012) “Good Enough” Pointing in Pervasive Computing. In CTS 2012. Lee, J.S., Tatar, D. & Harrison, S., (2012) Micro-coordination: Because We did not Already Learn Everything We Need to Know about Working with Others in Kindergarten. In CSCW 2012.